Power is the ability to apply gained strength in an explosive manner. 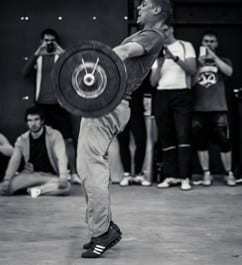 We develop power and strength through the use of the Olympic lifts and some basic powerlifting movements. At Power and Grace, we believe the Olympic lifts to be foundational for success in any athletic endeavor. Whether you are looking to grow in the Crossfit world, Olympic lifting world, or any other athletic field, the Olympic lifts are the best tool to that end. There are no other training methods in the world that develop so many different facets of an athlete in one movement. The capability of the Olympic lifts to develop speed, strength, agility, and so many other factors is the reason we give such attention to them. Furthermore, we emphasize the utility of the squat and deadlift. These are also necessary tools for the complete development of an athlete. The truth of the matter is that strength and power aren’t optional for an athlete anymore. Strength and power are a necessity for an athlete to compete at the highest level. Without these facets of the game, an athlete will always be catching up to those who train for those specific attributes. This is where the power comes from in our name. We believe the development of power is an absolute must to excel at your chosen fitness domain. Grace, as we define it, is the capability of an athlete to move and perform a ask with precision and efficiency. Grace is the ability of an athlete to complete the task before them with the greatest amount of efficiency possible. This is not to say that we don’t ask for effort for our athletes. On the contrary, moving with perfection and precision takes far more effort to master. If you’ve ever seen a swimmer compete at the Olympic level, their stroke looks far less strenuous than if a non-swimmer were to jump in the pool. The same is true of a baseball player hitting a homerun in the major leagues or a gymnast completing a routine in a meet. All of those things take great effort but as they perfect their skills and move with more defined precision, their efficiency produces greater results and ultimately opens more possibilities for what they can perform. Those that move perfectly require less energy to complete the task at hand and therefore have more energy to use throughout their athletic competition. We emphasize grace because we know that the best of the best compete and perform their sports near flawlessly. Our aim at Power and Grace, is not only to make athletes powerful but to allow them to use that power in such a way that no extra energy is used than is required. Finesse and precision matters in the sports world. Our aim is to make sure that all of our athletes are not wasting time and energy making their sport harder than it needs to be.